The inviting nose leads to a richly textured palate with flavors of citrus, stone fruit and a honey almond character. 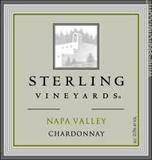 The Sterling Vineyards Napa Valley Chardonnay is a luminous, light gold color in the glass with fragrant aromas of fresh lemon crème, citrus, crisp apple and toasted hazelnut.The wine is well-balanced between an elegant, creamy roundness and a line of bright acidity. The pleasing finish is persistent and flavorful.